Rotation curve of the typical spiral galaxy M 33 (yellow and blue points with errorbars) and the predicted one from distribution of the visible matter (white line). The discrepancy between the two curves is accounted for by adding a dark matter halo surrounding the galaxy. 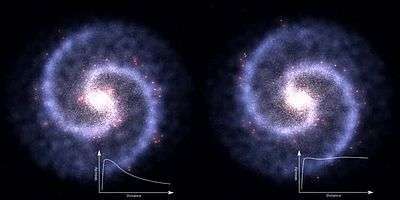 Left: A simulated galaxy without dark matter. Right: Galaxy with a flat rotation curve that would be expected under the presence of dark matter. The rotation curve of a disc galaxy (also called a velocity curve) is a plot of the orbital speeds of visible stars or gas in that galaxy versus their radial distance from that galaxy's centre. It is typically rendered graphically as a plot. The rotational/orbital speeds of galaxies/stars do not follow the rules found in other orbital systems such as stars/planets and planets/moons that have most of their mass at the centre. Stars revolve around their galaxy's centre at equal or increasing speed over a large range of distances. In contrast, the orbital velocity of planets in solar systems and moons orbiting planets decline with distance. In the latter cases, this reflects the mass distributions within those systems. The mass estimations for galaxies based on the light they emit are far too low to explain the velocity observations. The rotation curves of spiral galaxies are asymmetric. The observational data from each side of a galaxy are generally averaged. Rotation curve asymmetry appears to be normal rather than exceptional. The galaxy rotation problem is the discrepancy between observed galaxy rotation curves and the theoretical prediction, assuming a centrally dominated mass associated with the observed luminous material. When mass profiles of galaxies are calculated from the distribution of stars in spirals and mass-to-light ratios in the stellar disks, they do not match with the masses derived from the observed rotation curves and the law of gravity. A solution to this conundrum is to hypothesize the existence of dark matter and to assume its distribution from the galaxy's center out to its halo. Though dark matter is by far the most accepted explanation of the rotation problem, other proposals have been offered with varying degrees of success. Of the possible alternatives, the most notable is Modified Newtonian Dynamics (MOND), which involves modifying the laws of gravity. In 1932, Jan Hendrik Oort became the first to report that measurements of the stars in the Solar neighborhood moved faster than expected when a mass distribution based upon visible matter was assumed, but this measurement was later determined to be essentially erroneous. In 1939, Horace Babcock reported in his PhD thesis measurements of the rotation curve for Andromeda which suggested that the mass-to-luminosity ratio increases radially. He attributed that to either the absorption of light within the galaxy or to modified dynamics in the outer portions of the spiral and not to any form of missing matter. In 1959, Louise Volders demonstrated that spiral galaxy M33 does not spin as expected according to Keplerian dynamics. In the late 1960s and early 1970s, Vera Rubin, an astronomer at the Department of Terrestrial Magnetism at the Carnegie Institution of Washington worked with a new sensitive spectrograph that could measure the velocity curve of edge-on spiral galaxies to a greater degree of accuracy than had ever before been achieved. Together with fellow staff-member Kent Ford, Rubin announced at a 1975 meeting of the American Astronomical Society the discovery that most stars in spiral galaxies orbit at roughly the same speed, and that this implied that galaxy masses grow approximately linearly with radius well beyond the location of most of the stars (the galactic bulge). Rubin presented her results in an influential paper in 1980. These were the first robust results to suggest that either Newtonian gravity does not apply universally or that, conservatively, upwards of 50% of the mass of galaxies was contained in the relatively dark galactic halo. Although initially met with skepticism, Rubin's results have been confirmed over the subsequent decades. Observations of the rotation curve of spirals, however, do not bear this out. Rather, the curves do not decrease in the expected inverse square root relationship but are "flat", i.e. outside of the central bulge the speed is nearly a constant (the solid line in Fig. 1). It is also observed that galaxies with a uniform distribution of luminous matter have a rotation curve that rises from the center to the edge, and most low-surface-brightness galaxies (LSB galaxies) have the same anomalous rotation curve. The rotation curves might be explained by hypothesizing the existence of a substantial amount of matter permeating the galaxy that is not emitting light in the mass-to-light ratio of the central bulge. The material responsible for the extra mass was dubbed, "dark matter", the existence of which was first posited in the 1930s by Jan Oort in his measurements of the Oort constants and Fritz Zwicky in his studies of the masses of galaxy clusters. The existence of non-baryonic cold dark matter (CDM) is today a major feature of the Lambda-CDM model that describes the cosmology of the universe. where v(r) is the radial orbital velocity profile and G is the gravitational constant. This profile closely matches the expectations of a singular isothermal sphere profile where if v(r) is approximately constant then the density ρ ∝ r−2 to some inner "core radius" where the density is then assumed constant. Observations do not comport with such a simple profile, as reported by Navarro, Frenk, and White in a seminal 1996 paper. where the central density, ρ0, and the scale radius, Rs, are parameters that vary from halo to halo. Because the slope of the density profile diverges at the center, other alternative profiles have been proposed, for example, the Einasto profile which has exhibited better agreement with certain dark matter halo simulations. with Φ the galaxy gravitational potential. Since observations of galaxy rotation do not match the distribution expected from application of Kepler's laws, they do not match the distribution of luminous matter. This implies that spiral galaxies contain large amounts of dark matter or, in alternative, the existence of exotic physics in action on galactic scales. The additional invisible component becomes progressively more conspicuous in each galaxy at outer radii and among galaxies in the less luminous ones. Cosmology tells us that about 26% of the mass of the Universe is composed of dark matter, a hypothetical type of matter which does not emit or interact with electromagnetic radiation. Dark matter dominates the gravitational potential of galaxies and cluster of galaxies. Galaxies are baryonic condensations of stars and gas (namely H and He) that lie at the centers of much larger dark haloes of dark matter, affected by a gravitational instability caused by primordial density fluctuations. The main goal has become to understand the nature and the history of these ubiquitous dark haloes by investigating the properties of the galaxies they contain (i.e. their luminosities, kinematics, sizes, and morphologies). The measurement of the kinematics (their positions, velocities and accelerations) of the observable stars and gas has become a tool to investigate the nature of dark matter, as to its content and distribution relative to that of the various baryonic components of those galaxies. The rotational dynamics of galaxies are well characterized by their position on the Tully–Fisher relation, which shows that for spiral galaxies the rotational velocity is uniquely related to its total luminosity. A consistent way to predict the rotational velocity of a spiral galaxy is to measure its bolometric luminosity and then read its rotation rate from its location on the Tully–Fisher diagram. Conversely, knowing the rotational velocity of a spiral galaxy gives its luminosity. Thus the magnitude of the galaxy rotation is related to the galaxy's visible mass. While precise fitting of the bulge, disk, and halo density profiles is a rather complicated process, it is straightforward to model the observables of rotating galaxies through this relationship. So, while state-of-the-art cosmological and galaxy formation simulations of dark matter with normal baryonic matter included can be matched to galaxy observations, there is not yet any straightforward explanation as to why the observed scaling relationship exists. Additionally, detailed investigations of the rotation curves of low-surface-brightness galaxies (LSB galaxies) in the 1990s and of their position on the Tully–Fisher relation showed that LSB galaxies had to have dark matter haloes that are more extended and less dense than those of HSB galaxies and thus surface brightness is related to the halo properties. Such dark-matter-dominated dwarf galaxies may hold the key to solving the dwarf galaxy problem of structure formation. Very importantly, the analysis of the inner parts of low and high surface brightness galaxies showed that the shape of the rotation curves in the centre of dark-matter dominated systems indicates a profile different from the NFW spatial mass distribution profile. This so-called cuspy halo problem is a persistent problem for the standard cold dark matter theory. Simulations involving the feedback of stellar energy into the interstellar medium in order to alter the predicted dark matter distribution in the innermost regions of galaxies are frequently invoked in this context. There have been a number of attempts to solve the problem of galaxy rotation by modifying gravity without invoking dark matter. One of the most discussed is Modified Newtonian Dynamics (MOND), originally proposed by Mordehai Milgrom in 1983, which modifies the Newtonian force law at low accelerations to enhance the effective gravitational attraction. MOND has had a considerable amount of success in predicting the rotation curves of low-surface-brightness galaxies, matching the baryonic Tully–Fisher relation, and the velocity dispersions of the small satellite galaxies of the Local Group. Using data from the Spitzer Photometry and Accurate Rotation Curves (SPARC) database, a group has found the radial acceleration traced by rotation curves could be predicted just from the observed baryon distribution (that is, including stars and gas but not dark matter). The same relation provided a good fit for 2693 samples in 153 rotating galaxies, with diverse shapes, masses, sizes, and gas fractions. Brightness in the near IR, where the more stable light from red giants dominates, was used to estimate the density contribution due to stars more consistently. The results are consistent with MOND, and place limits on alternative explanations involving dark matter. A contribution due to dark matter is not ruled out, but would itself have to be fully predictable from that of the baryons; any other, independent, contribution is below the current limits of detection. MOND is not a relativistic theory, although relativistic theories which reduce to MOND have been proposed, such as tensor–vector–scalar gravity, scalar–tensor–vector gravity (STVG), and the f(R) theory of Capozziello and De Laurentis. ↑ Data are from: E. Corbelli, P. Salucci (2000). "The extended rotation curve and the dark matter halo of M33". Monthly Notices of the Royal Astronomical Society. 311 (2): 441–447. arXiv:astro-ph/9909252 . Bibcode:2000MNRAS.311..441C. doi:10.1046/j.1365-8711.2000.03075.x. CS1 maint: Uses authors parameter (link). The explanation of the mass discrepancy in spiral galaxies by means of massive and extensive dark component was first put forward by: A. Bosma, "The distribution and kinematics of neutral hydrogen in spiral galaxies of various morphological types", PhD Thesis, Rijksuniversiteit Groningen, 1978, available online at the Nasa Extragalactic Database and V. Rubin; N. Thonnard; W. K. Ford Jr (1980). "Rotational Properties of 21 Sc Galaxies with a Large Range of Luminosities and Radii from NGC 4605 (R=4kpc) to UGC 2885 (R=122kpc)". The Astrophysical Journal. 238: 471. Bibcode:1980ApJ...238..471R. doi:10.1086/158003. . See also: K.G. Begeman, A.H. Broeils, R.H.Sanders (1991). "Extended rotation curves of spiral galaxies: dark haloes and modified dynamics". Monthly Notices of the Royal Astronomical Society. 249: 523–537. Bibcode:1991MNRAS.249..523B. doi:10.1093/mnras/249.3.523. CS1 maint: Multiple names: authors list (link). ↑ Jog, C. J. (2002). "Large-scale asymmetry of rotation curves in lopsided spiral galaxies". Astronomy and Astrophysics. 391 (2): 471–479. arXiv:astro-ph/0207055 . Bibcode:2002A&A...391..471J. doi:10.1051/0004-6361:20020832. 1 2 For an extensive discussion of the data and its fit to MOND see Mordehai Milgrom (2007). "The MOND Paradigm". arXiv:0801.3133 [astro-ph]. .
↑ Kuijken K., Gilmore G., 1989a, MNRAS, 239, 651. ↑ L. Volders. "Neutral hydrogen in M 33 and M 101". Bulletin of the Astronomical Institutes of the Netherlands. 14 (492): 323. ↑ V. Rubin; W. K. Ford Jr (1970). "Rotation of the Andromeda Nebula from a Spectroscopic Survey of Emission Regions". Astrophysical Journal. 159: 379. Bibcode:1970ApJ...159..379R. doi:10.1086/150317. ↑ Rubin, V. C.; Thonnard, N.; Ford, W. K. Jr. (1978-11-01). "Extended rotation curves of high-luminosity spiral galaxies. IV - Systematic dynamical properties, SA through SC". The Astrophysical Journal Letters. 225: L107–L111. Bibcode:1978ApJ...225L.107R. doi:10.1086/182804. ISSN 0004-637X. ↑ V. Rubin; N. Thonnard; W. K. Ford Jr (1980). "Rotational Properties of 21 Sc Galaxies with a Large Range of Luminosities and Radii from NGC 4605 (R=4kpc) to UGC 2885 (R=122kpc)". Astrophysical Journal. 238: 471. Bibcode:1980ApJ...238..471R. doi:10.1086/158003. ↑ Navarro, Julio F.; Frenk, Carlos S.; White, Simon D. M. (1996). "The Structure of Cold Dark Matter Halos". The Astrophysical Journal. 463: 563. arXiv:astro-ph/9508025 . Bibcode:1996ApJ...462..563N. doi:10.1086/177173. Merritt, David; et al. (May 2005). "A Universal Density Profile for Dark and Luminous Matter?". The Astrophysical Journal. 624: L85–L88. arXiv:astro-ph/0502515 . Bibcode:2005ApJ...624L..85M. doi:10.1086/430636. ↑ Dorminey, Bruce (30 Dec 2010). "Reliance on Indirect Evidence Fuels Dark Matter Doubts". Scientific American. ↑ Weinberg, David H.; et, al. (2008). "Baryon Dynamics, Dark Matter Substructure, and Galaxies". The Astrophysical Journal. 678 (1): 6–21. arXiv:astro-ph/0604393 . Bibcode:2008ApJ...678....6W. doi:10.1086/524646. ↑ Duffy, Alan R.; al., et (2010). "Impact of baryon physics on dark matter structures: a detailed simulation study of halo density profiles". Monthly Notices of the Royal Astronomical Society. 405 (4): 2161–2178. arXiv:1001.3447 . Bibcode:2010MNRAS.405.2161D. doi:10.1111/j.1365-2966.2010.16613.x. ↑ P. Salucci, M. De Laurentis (2013). "Dark Matter in galaxies: leads to its Nature". arXiv:1302.2268 . Bibcode:2013arXiv1302.2268S. CS1 maint: Uses authors parameter (link). de Blok, W. G. The Core Cusp Problem. "Dwarf Galaxy Cosmology" special issue of Advances in Astrophysics. 2009. .
↑ S. S. McGaugh (2011). "Novel Test of Modified Newtonian Dynamics with Gas Rich Galaxies". Physical Review Letters. 106 (12): 121303. arXiv:1102.3913 . Bibcode:2011PhRvL.106l1303M. doi:10.1103/PhysRevLett.106.121303. ↑ J. D. Bekenstein (2004). "Relativistic gravitation theory for the modified Newtonian dynamics paradigm". Physical Review D. 70 (8): 083509. arXiv:astro-ph/0403694 . Bibcode:2004PhRvD..70h3509B. doi:10.1103/PhysRevD.70.083509. ↑ J. W. Moffat (2006). "Scalar tensor vector gravity theory". Journal of Cosmology and Astroparticle Physics. 3 (03): 4. arXiv:gr-qc/0506021 . Bibcode:2006JCAP...03..004M. doi:10.1088/1475-7516/2006/03/004. . S. Capozziello, M. De Laurentis (2012). "The dark matter problem from f(R) gravity viewpoint". Annalen der Physik. 524 (9-10): 545–578. Bibcode:2012AnP...524..545C. doi:10.1002/andp.201200109. CS1 maint: Uses authors parameter (link). V. Rubin; W. K. Ford Jr (1970). "Rotation of the Andromeda Nebula from a Spectroscopic Survey of Emission Regions". Astrophysical Journal. 159: 379. Bibcode:1970ApJ...159..379R. doi:10.1086/150317. This was the first detailed study of orbital rotation in galaxies. V. Rubin; N. Thonnard; W. K. Ford Jr (1980). "Rotational Properties of 21 Sc Galaxies with a Large Range of Luminosities and Radii from NGC 4605 (R=4kpc) to UGC 2885 (R=122kpc)". Astrophysical Journal. 238: 471. Bibcode:1980ApJ...238..471R. doi:10.1086/158003. Observations of a set of spiral galaxies gave convincing evidence that orbital velocities of stars in galaxies were unexpectedly high at large distances from the nucleus. This paper was influential in convincing astronomers that most of the matter in the universe is dark, and much of it is clumped about galaxies. Galactic Astronomy, Dmitri Mihalas and Paul McRae.W. H. Freeman 1968.